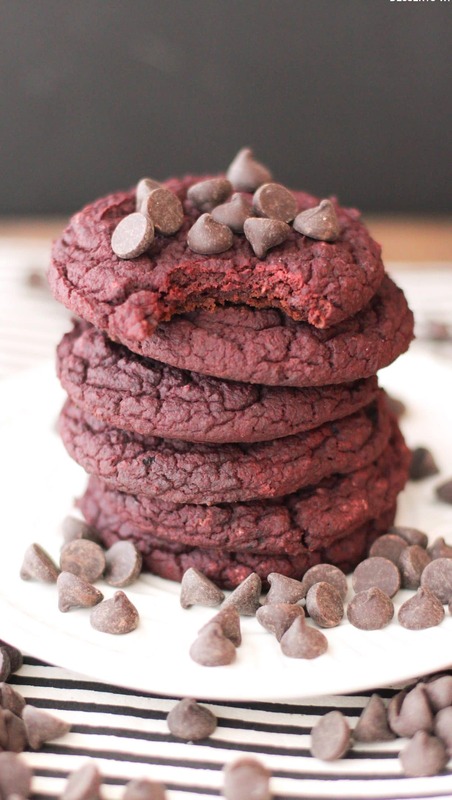 Healthy Red Velvet Gooey Butter Cookies – like Red Velvet Cake in a palm-sized cookie! I replied with a simple, “Yes,” and we talked about how it’s important to eat healthy. After a couple of minutes he said it’s hard for him to eat healthy because he doesn’t like “rabbit food.” I was a little shocked. Did he consider my Costco purchase to be rabbit food? Do other people think I eat like a rabbit? My initial shock turned into confusion (mostly because I didn’t even buy carrots, aka actual bunny food) because I don’t feel like I eat bunny chow. I mean, as I unloaded the groceries into my car, I could see how boring and plain everything looked, but that’s because it hasn’t been prepared yet! I don’t like buying pre-made food because it’s always super processed, artificial, overly salted, overly sweetened… basically overly everything. I wish I could show people (especially that employee) that when prepared correctly, healthy food can taste good damn delicious. 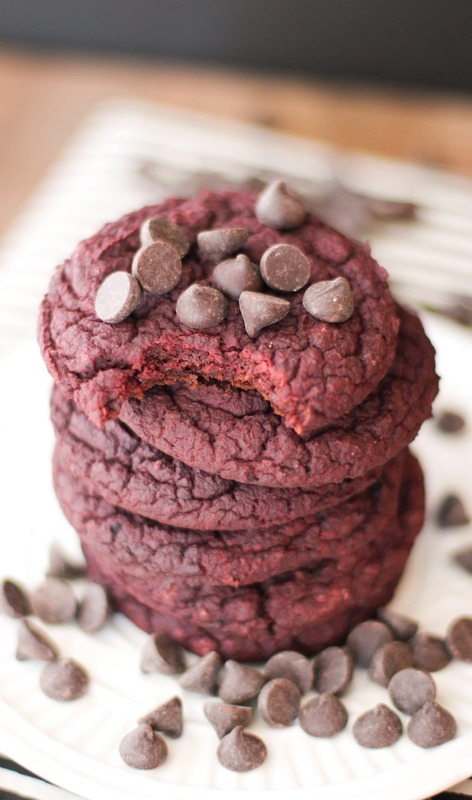 These Healthy Red Velvet Gooey Butter Cookies fit the bill. They’re chewy, chocolatey, rich, and delicious! And it ISN’T rabbit food in the slightest. Because dessert is for humans, carrots are for rabbits. 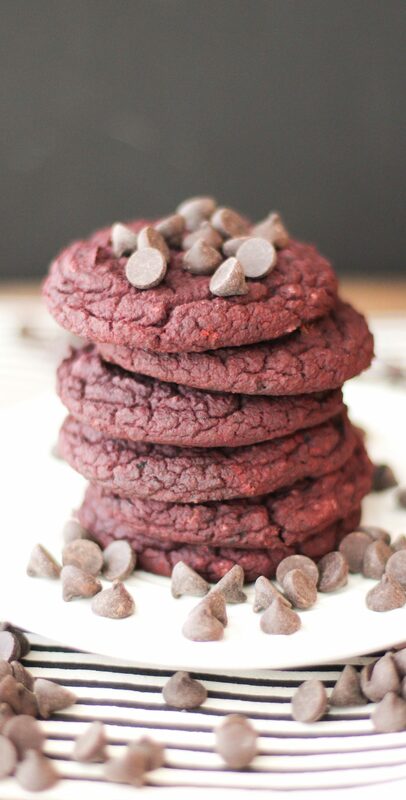 These Red Velvet Gooey Butter Cookies are like Red Velvet Cake in cookie form! NO butter, white sugar, bleached flour, or artificial food coloring whatsoever. And only 67 calories per cookie! Rinse and gently scrub a medium beet, then wrap it in foil. Place the beet on a jelly roll pan and bake for 1 hour, or until a fork pierces through the center with ease. Carefully unwrap the beet and let cool for 30 minutes. Scrape off the beet skin (they should peel off easily) and chop into chunks. Add the beet chunks to a food processor and purée until completely smooth. Add the garbanzo beans, erythritol, roasted beet puree, almond milk, Earth Balance and extracts to a high speed blender (I used my NutriBullet) and puree until very smooth (batter should be a bright fuchsia). Preheat the oven to 350 degrees Fahrenheit and line two cookie sheets with parchment paper. Scoop the mixture out of the blender and into a large bowl. In a small bowl, whisk together the cocoa powder, oat flour, flax, baking powder and salt. Dump this over the wet ingredients and whisk together well. Whisk in the vinegar. The dough/batter should be like muffin batter, not thick like cookie dough or thin like cake batter. Use a cookie scoop to portion the batter onto the prepared cookie sheets. I used a 2" cookie scoop. Flatten the batter "domes" into cookie shapes by swirling your finger gently on the surface. Bake for ~19 minutes, or until the cookies are no longer wet or shiny looking. Lightly tap the center of the cookies, if they are mushy in the middle then bake them for another minute or two. Let cookies cool ON THE PAN. Serve once they're completely cooled and set. The beans made up the majority of the bulk in the cookies, and as the main ingredient, it shouldn’t be replaced. These look so good and excellent for sneaking in the good stuff! I wonder how they would turn out if I were to make them into brownies? I will try! I would recommend using a more neutral flavor puree, like carrot or sweet potato. You can just buy jarred baby food from the grocery store. I know that sounds REALLY strange but it’s the easiest. Of course, just make sure to read the ingredients, you don’t want baby formula or chicken or peas or anything! Just 100% carrot or 100% sweet potato. Jess!! These look amazing. I’m super impatient and don’t want to wait for vitacost to ship me the sorghum flour I ordered 🙂 would coconut flour work do you think? Hey! I just made these, and they came out amazing. One question though – you have 1 tsp white vinegar listed in the ingredients, but you never say where to use it. I left it out and everything still tasted excellent. Thanks for the recipe! OOPS! Sorry about that, I just updated the instructions to include the vinegar part. Doh! Can I substitute with a different flour? These look amazing but I am currently watching my carbs. Would you have an idea of how to reduce carbs in this recipe? At my local Meijers store, you can buy canned no salt added beets. Is there any reason I couldn’t just puree those up and use them? After draining them. That would explain why when I tried it I did not get the right color. But flavor was good, they just looked like chocolate cookies. I will try it next time with the roasted beets that I made earlier this summer and then froze. They have more color. I assume the vanilla is added to the wet ingredients? Me again with more questions. Dark red or light red kidney beans? What is the purpose of the vinegar? My can of kidney beans didn’t specify dark or light, they’re just the red ones. And the vinegar keeps the batter on the acidic side, which helps maintain the red color. Without it, the cookies may turn brown. I still can’t get the red color. Mine are brown. I am using nestle natural cocoa powder. It is when I add th cocoa powder that I get the brown color. What brand of cocoa powder are you using? The kidney beans and beet puree should provide quite a bit of red color, and the vinegar should help maintain that color. They taste fine and the texture is good. I just can’t get a red color and I am weighing everything. I did add all the dry ingredients separately and It is the coca which turns everything to a very dark burgundy that becomes brown in the oven. That is why I asked about the brand of cocoa powder. Because different brand have different colors. 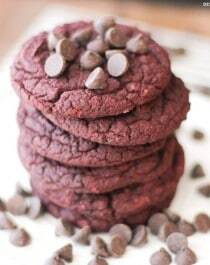 I’ve made these cookies both ways — once using pure beet puree and once using the beet puree made with added lemon juice. Both came out red and basically the same. I have one other question. I assume that the lemon juice mentioned in the beet puree instructions is just for the cake, or is it perhaps for the cookies as well? I have not been adding the lemon juice. i am still trying to get the color. Just wondering if it would be possible to use coconut oil in replace of the Earth Balance spread? Or would it be took liquid-y? Also do you think a portion of the butter spread could be replaced with applesauce? Since there is so much beet puree in the recipe, which is basically like applesauce in terms of adding moisture and replacing fat, I wouldn’t recommend swapping the oil/Earth Balance with applesauce. I haven’t tried using coconut oil here, but I guess you can try it out? It might be a little too liquidy, so I would consider reducing the almond milk by 1 tablespoon. Hope you like/LOVE the cookies!! Going to be making this recipe today and was wondering if you could replace the Earth Balance with Ghee? I have a friend who has been going through the GAPS diet and I can’t get the Earth Balance in time, and she suggested Ghee instead. Thank you so much!!! I noticed in the comments many people mention using kidney beans, but the recipe calls for Garbanzo beans. Are they interchangeable?